I'm reading ... A Left-Handed History of the World by Ed Wright. Fellow left-handers who've achieved so much more than I have! I'm up to the section on Ghandhi at the moment. I'm obsessing over ... reconciling the books I've downloaded with my list of books I want to read. I downloaded nearly 3,000, so there's a bit of work there. 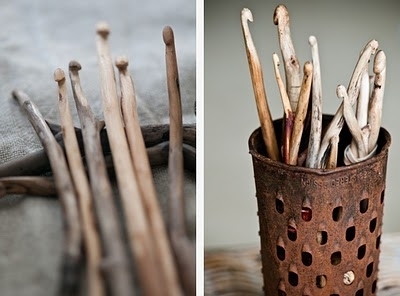 The picture ... these hand-carved crochet hooks are just gorgeous. I've been heavily into crochet lately. Any other craft just seems a bit wrong and unfamiliar. I get like that when I'm obsessed with one craft! I'm even planning on some larger projects - blankets mainly. This is a big change for me; up until recently, anything bigger than a scarf would freak me out completely. Speaking of scarves, I finished (another!) one recently. I'll post pictures soon.